HTRX-010 Quick Triaxial Cell - OFI Testing Equipment, Inc. The GCTS Quick Triaxial Cell was designed for fast and easy testing of rock cores with diameters from 25 mm to 54 mm (NX). The prepared specimens with the top and bottom platen are simply dropped inside from the top. Three lateral actuators instrumented with LVDTs that are pressure-compensated ensure a firm contact with the specimen to precisely measure the radial strains. The LVDTS eliminate the time-consuming task of gluing strain gages onto the specimen to measure radial strains. Axial strains are measured with two averaging vertical LVDTs. 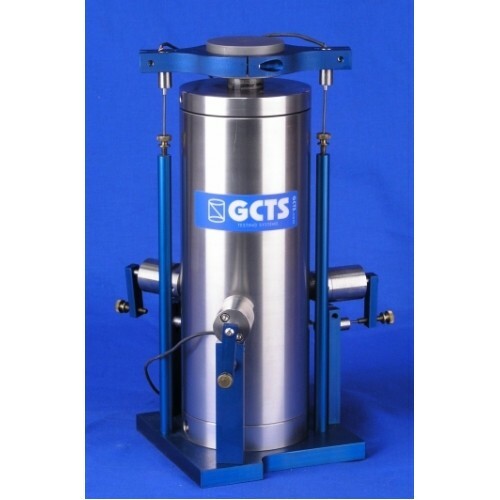 GCTS offers economical loading frames that are manually operated (hand pump) to apply axial loads up to 500 kN. The HTRX-010 triaxial cell fits inside the GCTS Point Load tester frame. 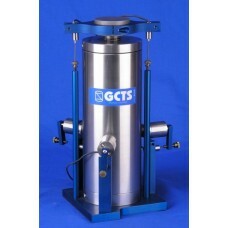 GCTS also offers several different pumps (manual and automated) for applying the cell pressure. The complete system (triaxial cell, loading frame, and data acquisition) fits inside a carrying case. The included automatic data acquisition with USB interface allows the connection to a Laptop or PC computer for real time display of stress-strain curves. The HTRX-010 is ideal for the classroom. 70 MPa (10,000 psi) pressure & 500 kN (100 kips) axial load capacity. Axial and radial strain measurements. Upper platen provided with a spherical seat to compensate for non-parallel specimen ends. Bottom pore pressure plumbing provided for effective stress measurements. Includes triaxial software and automatic data acquisition with USB interface. Accepts samples with a diameter from 25 mm to 54 mm (NX) and with a length of 2 times the diameter (one different set of platens and membrane retainer is required for each size).